How Much Does A Photo Booth Cost To Buy and Hire Out? With the massive growth being seen in the portable photo booth hire business for weddings, parties, corporate and other events it is extremely important that when looking to buy a photo booth to hire out you choose a system or package that will be attractive to your potential customers. The question how much does a photo booth cost to buy and how much should you spend is therefore an extremely important question for you to consider. You should not base your decision purely on the bottom line cost but more on how you can sell the features and benefits of your system to those that will be hiring it from you. To buy a photo booth system can cost anywhere between £6k-£12k, depending on your choice of photo booth supplier, frame style, equipment supplied and software. All these elements being extremely important in your choice of system. For example many of the cheaper systems on the market will use a piece of software similar to Breeze, which is available off the internet for around £120.However this is a general photo processing software package and not specifically designed for the speed and functionality required in a more attractive bespoke Photo Booth system. An example being most of the set-up needs to be done ahead of the event and very few changes i.e. 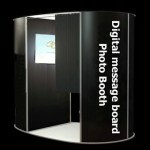 switching between multiple images, larger single images and video, can be made to the settings during an event without, having to spend a long time re-configuring.oto processing software package and not specifically designed for the speed and functionality required in a more attractive bespoke Photo Booth system. Whereas a bespoke Photo Booth Software package as part of your system would allow you to make similar changes within 20-30 seconds during an event – much more attractive to your customer. Additionally the size, weight and ease of assembly of your photobooth frame is extremely important to how your business operates – ideally you want a bespoke system that is quick to assemble, can easily be carried (i.e. in and out of lifts, up-stairs etc.) as well as in the boot of your car. Ideally your frame should be made of lightweight aluminium sections providing both strength and ease portability and without any additional nuts or bolts etc., which would slow down assembly. The outer skins should be lightweight and interchangeable with Velcro strip fixings to again enable quick and easy assembly and dismantling. Also such a system would give you more flexibility where different outer skins are required for different events or customer branding etc. Finally you should consider all the options you will be providing your customers from green screens to enable your customers to be able to select their own backgrounds, the quality of the camera equipment, speed and quality of printer and optional accessories such as wind machines for added interest and fun for your customer. I hope this post has provided you with some food for thought when considering how much does a photo booth cost to buy and how much you are looking to spend on your photo booth. If you would like more information on the range of photo booths from easypartybooth.com please feel free to visit our site. Just recently in the UK photo booth hire has become extremely popular as people don’t want to go down the route of hiring a traditional photographer for events such as birthdays, weddings, engagements, anniversaries, re-unions, bar mitzvah’s, proms, corporate events and many more social occasions. There isn’t just one photo booth too choose from in the modern times of 2012, we now offer 3 different booths. There is the regular Party Booth. The Party Booth comes is around the price of £499 for 4 hours photo booth hire time. You also get a whole load of extra’s in the form of: Video messages, instant unlimited printed photos, facebook sharing, own web page with all the videos and photo uploaded on too it, this web page is also password protected, so the whole world can’t see them, free delivery and set up, a photo booth attendant, a dressing up prop box, USB with all videos and pictures on. We also have the Party Pod which comes with all the above details, but the party pod is more appropriate for smaller tighter venues, and the Party Pod isn’t a walk in booth like the Party Booth. We then have the newest member to our photo booth gang in the form of the New York Taxi, the New York taxi was featured in Home Alone 2, Bronx is burning ( with Jennifer Lopez ) and also Fame the musical, it’s like having Hollywood at your event! There is only 2 in the whole of the UK, so if you want the WOW factor at your event then the New York taxi is definitely the way to go! The photo booth system is built in to the back of the taxi and features video recording, unlimited photo printing, facebook sharing, screen streaming, props, dual camera, and touch screen operation, the taxi can fit 6 people and can be driven to any event with access. All photo booth systems have extra’s that can be bought such as, idle hours, extra hours, printed keyrings, you can also have the photo booths skinned to your own design. In our March deal, we are giving away a freebie worth £100 with every photo booth system hired, in the form of a guestbook, and a free second set of prints. Photo Booths As A Business. Setting up a new business can be extremely difficult, but choosing the right business to set up, can make things a lot easier, currently in the UK photo booth hire is becoming extremely popular and is a great new business to set up. It’s so easy to set up as well! If you’re wondering why you should choose your new business to be photo booth hire, there’s a simple answer to that! You can hire photo booths out to any event such as weddings, birthdays, proms, re-unions, engagements, anniversaries, bar mitzvah’s, corporate events, and so many more social occasions. So many people have given positive feedback from their experience with photo booth hire, as photo booths bring pure fun and giggles to any event, and also provide event guests with a beautiful everlasting memory of the event they attended. To start a new photo booth business it costs around £7200 depending on what company you choose to buy your photo booth system from. When you buy a photo booth from us we provide you with so many extra’s to make sure your new business starts off smoothly, for around £7200 we provide you with the full photo booth system, full training of how to operate the photo booth system no computer experience is needed, 500 business cards and 1000 leaflets to help kick start the advertising for your new photo booth business, a template website and contact details, so it’s easier for you to develop customers, wedding fayre guidance, and on going support and business help for 12 months, which should give you a bit of comfort knowing that there will be someone there to help you out with any queries. Photo booth hire is definitely a great new business to start up.